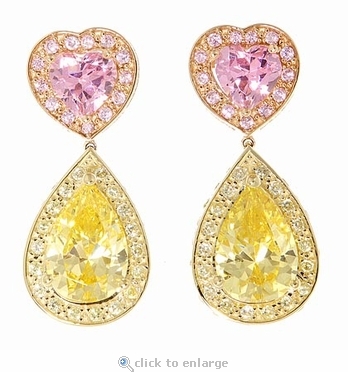 The Lianna Pink Heart Canary Pear Cubic Zirconia Halo Drop Earrings feature a 1 carat 6mm simulated pink diamond heart encircled with a halo of pave set simulated pink cubic zirconia rounds in a heart shaped top which is set in 14k rose gold. 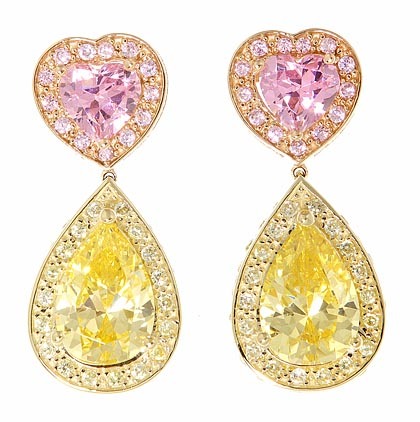 The 3 carat pear drop is an intense colored canary pear, measuring 12x8mm and encircled with a halo of canary round cubic zirconia stones set in 14k yellow gold. Our Russian formula diamond quality stones are hand cut and hand polished to exact diamond specifications for a stunning finished product. The earrings measures approximately 1.25 inches in length and can also be ordered in 14k white gold or 14k yellow gold, please see the pull down menu for options. These earrings include standard 14k gold push backs or you can upgrade to the large back option, please see the pull down menu for options. For non pierced earlobes, French clips or Omega clips are available via special order. For further assistance, please contact us directly at 1-866-942-6663 or visit us via live chat and speak with a knowledgeable representative. A matching necklace is also available via special order. Please see item #N1047.